The Congress Parkway bridge over the river finally re-opened a few weeks ago. If you’re like most of the thousands who drive it every day, you probably don’t realize the bridge is officially named for Clarence Wagner. When the Congress (Eisenhower) Expressway was being built in 1953, Clarence Wagner was one of Chicago’s most powerful politicians—perhaps the most powerful. He was 14th Ward alderman, chairman of the council&apos;s Finance Committee and his ward&apos;s Democratic committeeman. Mayor Martin Kennelly was well-meaning but weak, so Wagner practically ran the city. In July of 1953 Cook County Democratic committeemen held a meeting to choose a new chairman. It was assumed to post would go to County Clerk Richard J. Daley. Party insiders whispered that Daley would then challenge Kennelly for mayor in the next primary. But at the meeting, Alderman Wagner asked that the vote for chairman be delayed two weeks. His motion carried. The meeting adjourned, with Daley still just another committeeman. You can read conflicting explanations of what Wagner was up to. Most likely, he’d decided he was just as qualified as Daley to be county chairman . . . or mayor. In the meantime, Wagner took a short fishing vacation with another politician and their young sons. The alderman was at the wheel of his Cadillac on a Minnesota road the morning of July 10th when he missed a turn and crashed the car. 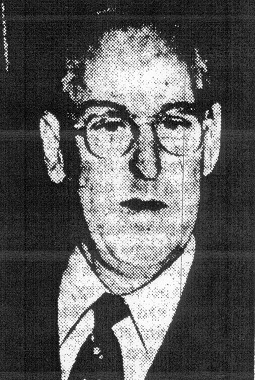 Though the passengers escaped with injuries, Clarence Wagner was killed. Mayor Kennelly wept when he heard the news. So did many other politicos, for Alderman Wagner was well-liked. Crowds packed the wake at his home on May Street, and the funeral Mass at Visitation Church. A hundred cops were put on special duty to keep the traffic moving. Would Wagner have become mayor if he’d lived? We’ll never know. Daley did become party chairman, and did oust Kennelly from the mayor’s chair in 1955. And of course, Daley the Younger later won the office. But the Daleys weren’t the only political dynasty that arose with Clarence Wagner’s death. The man chosen to succeed Wagner as 14th Ward alderman was Joseph Burke—who was eventually followed by his son, still-serving Ed Burke. Four days after Wagner’s death, the city council voted to name the new expressway bridge after their late colleague. In all the years since then, there has never been a plaque on it dedicated to Clarence Wagner&apos;s memory. Now would be a good time to correct that oversight.